IMTFI Blog: Can financial inclusion be synonymous with financial justice and equity? Can financial inclusion be synonymous with financial justice and equity? In IMTFI's PERSPECTIVES blog series, IMTFI’s International Board members and affiliated researchers take on the definition of financial inclusion. This series aims to foster an open dialogue on issues around money, technology, and financial inclusion for the world’s poor. Individual contributions reflect contributors' own reflections on recent events based on their research and areas of expertise. The topic of financial inclusion will conclude with a capstone white paper by IMTFI titled "Mobile Money: The First Decade." From April 21st to the 22nd, Cornell University’s Institute for African Development and the Cornell International Institute for Food, Agriculture and Development sponsored a symposium titled “Mobile Money, Financial Inclusion, and Development in Africa.” IMTFI researcher Ndunge Kiiti was one of the event’s organizers, and IMTFI was a co-sponsor. The symposium presented an opportunity for academics and development experts to come together and discuss the current state of mobile money in Africa, its effects on the continent’s financial development thus far, and some of the obstacles and tensions that have arisen around financial inclusion. It also afforded a reunion of sorts for a number of IMTFI-affiliated researchers. In this blog post, I will focus on their presentations and the concluding discussion, both of which produced some sobering critiques of financial inclusion as an agenda for international development. After lunch, an unofficial “IMTFI panel,” titled Mobile Money and Remittances—Lessons in and Beyond Africa, featured IMTFI researchers Vivian Afi Dzokoto and Ishita Ghosh as well as former IMTFI postdoctoral scholar Ivan Small discussing mobile money research in global context. 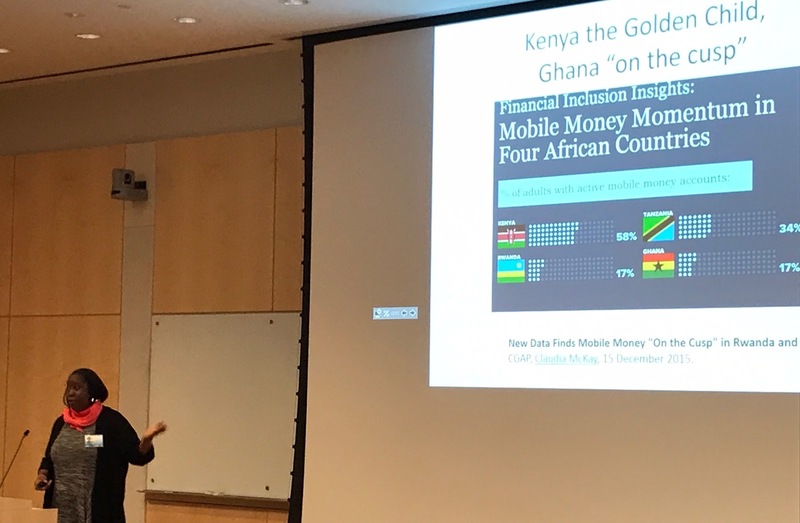 Dzokoto’s presentation, “Mobile Money in Ghana: Past, Present and Future,” raised an important contrast to Kusimba’s research, and in so doing reiterated the reality of “one size doesn’t fit all” that has confounded mobile money service providers. Ghana shares many similarities with Kenya when it comes to GDP PPP, share of the population who are unbanked, and widespread access to mobile phones. However, development experts and mobile network operators alike have lamented mobile money’s relatively slow adoption in Ghana when compared to its East African counterpart. In her talk, Dzokoto highlighted several key differences between Ghana and Kenya that help to explain why mobile money has failed to scale as quickly as some would have hoped. First, differences in immigration patterns: Whereas migration from rural villages to cities and the remittance corridors that followed helped to propel M-Pesa’s adoption in Kenya, these trends did not and do not exist in Ghana to the same degree. Second, the regulatory environment: the Central Bank of Kenya’s early embrace of mobile money and willingness to work with Safaricom and brick-and-mortar banks to create an enabling environment was a fundamental condition of M-Pesa's possibility. Ghana is a good counterexample of what happens when banks see mobile money as competition instead of as an opportunity for collaboration with telcos. The Ghanaian public also has very little trust in mobile network operators, in part because of network outages and infrastructural shortcomings. Education and outreach have been lacking in Ghana, too, with very few of Dzokoto’s respondents reporting that they knew how to use mobile money or had any sense of why it might be useful for them to do so. Finally, there is the fact that Ghanaians love cash and see little reason to use mobile money when cash is an option. Building on research that she has been involved with for nearly a decade, Dzokoto explained that the cedi’s redenomination in 2007 ended up incentivizing the use of cash and disincentivizing adoption of mobile money; since Ghanaians no longer had to carry around large piles of cash for even basic transactions, one of mobile money’s potential advantages—i.e. a more secure, more convenient mode of value transfer—was essentially obviated. All of these factors have combined to make mobile money an “option of last resort” in Ghana, used primarily for emergencies and remittances rather than day-to-day transactions. Ivan Small’s presentation, “Remittance Technology Models: African Innovations for Southeast Asia?”, considered how the lessons gained from mobile money services in Africa might inform their deployments in Southeast Asia, specifically in Laos and Vietnam. As noted above, remittances and remittance corridors have been instrumental in the adoption of mobile money in places like Kenya. Small argued that the focus on harnessing remittances for development illuminates a few interesting points. First, development discourses have shifted from seeing migration primarily as a negative (e.g. anxieties about “brain drain”) to seeing it as a positive. Moreover, development experts—especially those working in and around financial inclusion—have come to understand internal migration and domestic remittances as potentially more significant than international ones. At the same time, since the early 2000s, anti-money laundering and counter-financing of terrorism initiatives have brought greater regulatory and public attention to remittances, for better and for worse. If remittances are so important to the success or failure of mobile money, then it is imperative to understand the specific contours of remittance practices in a given environment. As Small pointed out, local cultural ecologies and monetary repertoires influence adoption of new services like mobile money and affect financial practices in often unexpected ways. Uptake depends not only on local savings and transfer behaviors, but also on trust in networks, both social and technical; for example, the relative instability and unavailability of electricity in Laos has proven to be a challenge for mobile money. Furthermore, material liquidity continues to be prevalent throughout Southeast Asia because of long histories of conflict and political instability. In her talk, “Informal Loans and the Mobile Phone: Glimpses into the Coping Strategies of the Urban Poor in Uganda and India,” Ishita Ghosh compared research on lending practices and strategies in East Africa and on the Indian subcontinent. She raised a deceptively simple research question that has profound implications: when the option of using mobile money for securing loans exists, why aren’t people calling upon their distant social networks and instead are maintaining their proximate networks? The answer, she argued, is because in both Uganda and India there are important symbolic significances entailed by in-person transactions that make them preferable alternatives. Social etiquette matters; asking for a loan through a mediating technology like a mobile phone is difficult for many people because it does not afford the same opportunities to perform self-effacement and gratitude as a face-to-face interaction. Thus, reducing transaction fees for mobile money transfers and making interest-free loans available ultimately do not matter if the underlying social norms that influence financial behavior go unaddressed. Moving forward – Financial Inclusion or Financial Justice? The symposium’s final panel, Perspectives, Potentials, and Promises—What Next?, was moderated by IMTFI researcher Ndunge Kiiti, and featured Willene Johnson, former U.S. Executive Director of the African Development Bank; Melita Sawyer from Tufts University’s Fletcher Leadership Program in Financial Inclusion; Lourdes Casanova, Director of the Emerging Markets Institute; and Edward Mabaya, Senior Research Associate in Cornell’s Charles H. Dyson School of Applied Economics and Management. In her opening remarks, Kiiti noted three potential threads to think about moving forward. First, research has made it clear that in order for mobile money to flourish, stakeholders such as telcos, banks, and regulators need to work together, and so figuring out how best to facilitate their alignment will be crucial. Second, when looking at new entrants into the mobile money space like Alibaba’s Alipay, are services like M-Pesa becoming "backwards" before they are even over? In other words, trying to replicate M-Pesa outside of Kenya and simply hoping for the best clearly isn’t working, so what best practices should mobile money providers adopt in order to remain innovative, not to mention effective? Third, we have learned over and over again just how important remittances are not only for mobile money, but more importantly to the financial practices of the unbanked, and so one practical step that must be taken is reducing the price of remitting money, both domestically and transnationally. technologies, but they’re only as useful as the problems they solve.” The main problems that the panelists and audience members identified were twofold. First, there is clearly a need to develop a framework that can facilitate strategic partnerships among businesses, governments, development agencies, and, of course, the financially excluded. But who is best equipped to take the lead? The consensus was that it depends upon the problem at the time, and that like mobile money, one solution will not work everywhere or for every situation. Everyone agreed, however, that governments need to be more involved in helping to bridge disputes among banks, mobile network operators, and fintech innovators. Government regulators in particular are in the unique position to demand that financial practices be unbundled from the big banks. But at the same time, none of these interest groups can try to dominate the others. The second problem, which builds upon the first, was well articulated in a comment from the audience: What do banks, insurance companies, and mobile network operators all have in common? They have all been deemed “too big to fail,” and thus enjoy subsidization by governments and aid organizations that allow them access to the poor in the name of “inclusion.” What are the distributional consequences of this? If the point of financial inclusion is making financial services more available, accessible, and affordable for marginalized social groups, can we honestly say that this has been the outcome, or are we simply propping up old vulnerabilities and creating new ones in the process? As Kusimba raised in her talk and the panelists echoed in their remarks, what does finance mean for someone living on less than $2 per day? Can we assume that traditional ways of approaching finance informed by centuries of banking practices are appropriate or even desirable for the financially excluded? A larger question that grows out of these critiques is whether or not financial inclusion, as presently articulated, can be synonymous with financial justice and equity. And if so, can mobile money contribute to improving financial justice, or will it only perpetuate the same inequalities that many hoped that it would help solve? Over the next few weeks, the IMTFI blog's PERSPECTIVES series will feature reports from a number of conferences where participants have grappled with these same questions.